Wake Forest’s home of Winston-Salem is a dynamic city with a rich Moravian history, but freshmen Jared Benckert and Michael Littrell believe that one aspect of its culture fails to represent the city’s heritage adequately: its flag. As a result, the two students, who live in Winston-Salem year-round, have created a Change.org petition and social media campaign to convince the Winston-Salem City Council to approve a flag redesign contest. According to Benckert and Littrell, city flags should be simple and easily recognizable enough that they can inspire a sense of pride amongst residents. Like many other city flags, the current design resembles a “seal on a bedsheet,” and lacks simple and bold patterns, so its features are not easily seen while it is fluttering in the wind at a distance. Benckert and Littrell argue that the ineffective flag is a symptom of a wider lack of community integration and pride in the city. Littrell commented on the city’s lack of community cohesion by questioning what Winston-Salem citizens are called. They hope that a redesign contest and a resulting new flag could ameliorate city pride. The flag design of two Wake Forest students. While they advocate for a contest open to residents of Winston-Salem, Benckert and Littrell have created their own example design, implementing themes from the current design and the history of Winston-Salem. The current flag emphasizes the unity of Winston and Salem to create Winston-Salem, so prominent features on their design include a Moravian star to allude to the Moravian settlement of Salem and a horizontal stripe to represent the railroad that cultivated industry by connecting Winston to the rest of North Carolina. 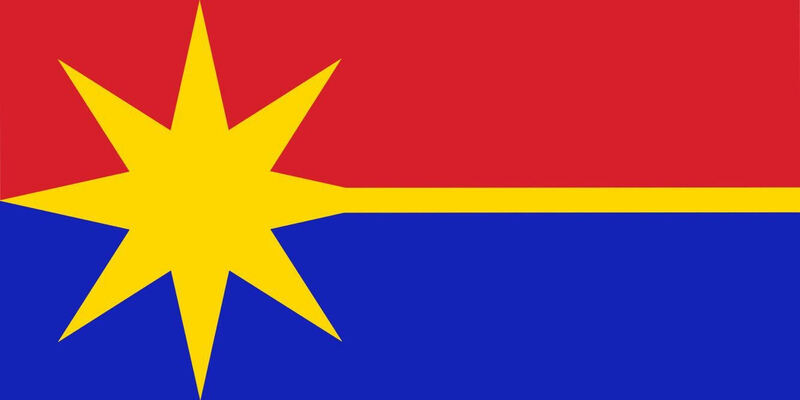 The star and stripe intersect as one to signify the unification of the two cities. In addition, Benckert and Littrell maintained the current flag’s primary color scheme, including blue to represent unity, red to represent pride of the city, and yellow to represent justice and affluence as well as the Golden Leaf tobacco that put Winston-Salem on the map. However, Benckert and Littrell emphasize that they do not necessarily advocate for their particular design to replace the flag. “We think a contest is a really important aspect of this,” Littrell said. “People care about their flag if they pick it.” They plan to post submitted designs on their Twitter account, @FixThatFlagWS, so that they can be viewed by a wider community of participants. In addition, Benckert and Littrell intend to use their flag redesign proposal to start conversations about poverty in Winston-Salem. Twenty-five percent of Winston-Salem residents live below the poverty line, which is well above both the North Carolinian and national rate. In addition, it is the third hungriest city in America. “I went to the City Council and gave a speech about a flag, but if I had talked about poverty, it wouldn’t have been on the front page of the newspaper,” Benckert said. They plan to find a food bank or other charitable organization to promote on their social media accounts and suggest that anyone who submits a flag design also consider supporting efforts to help the hungry. A wider message of their work is that if a more effective flag can bring about a greater level of community integration, then investment can in turn benefit the community.